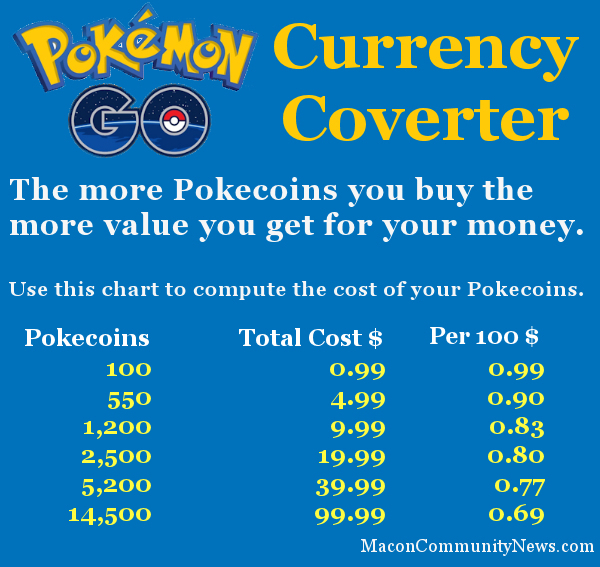 Use this chart to convert Pokémon GO Pokecoins into the corresponding cash value. If you’ve been to downtown Macon, you have likely seen people walking with their heads in their phones swiping furiously. No, texting has not become more popular, Pokémon GO has become a popular hit game that has brought Maconites into the augmented world of Pokémon. The game truly comes into its own in an urban environment, where the many landmarks become in-game goals that encourage walking and discovering the history and culture of the community. Despite the usual problems that happen when anything becomes popular, the overall effect of the game has been overwhelmingly positive. 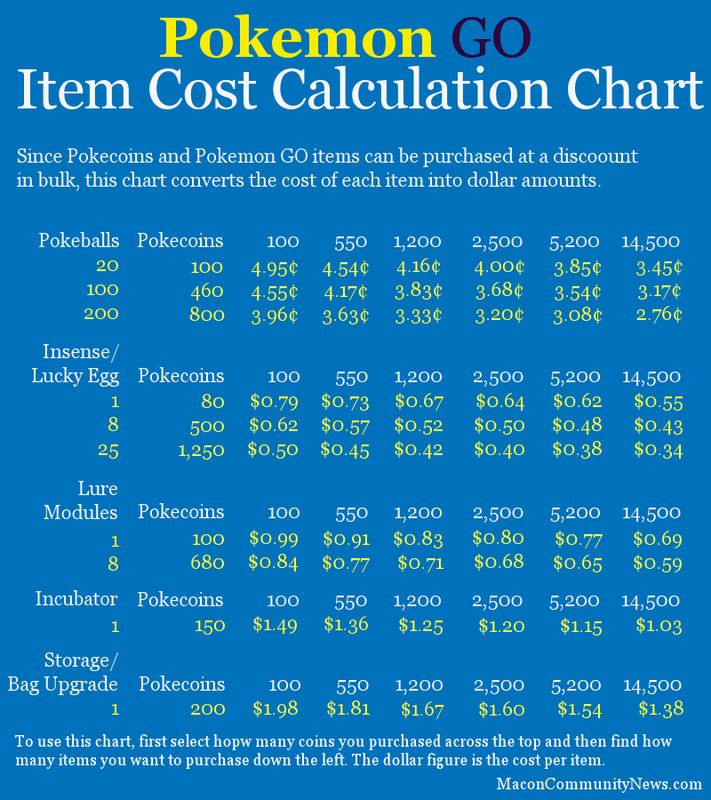 Use this chart to convert Pokémon GO item cost into true dollar cost. “It’s gotten me out of my house and walking around the neighborhood. I’ve also discovered a few things I had no idea existed” said one player. Many of the downtown venues who are close to “Pokespots” have also included the game into their offerings, including theme nights and drinks. If you are someone who compulsively plays video games, this might be a healthier option than those that are more passive. It is also a good way to meet new friends congregating around Pokegyms. Most of the game is free, but there are in-game purchases available for those who want to take it to the next level. To help you make an informed buying decision, we’ve included a couple of charts that convert the in-game currency and items into dollars. If you know someone that could find this useful, freely share it.